Doctors classify RSDS into different stages. It helps to understand the complexity of the disease. Some patients may never advance to Stage 3 and only a very few patients will advance to Stage 4. It may be difficult to determine your stage due to the combination and/or lack of symptoms. The length of time given for each stage is just a benchmark as each individual can have different symptoms from different stages last for different lengths of time. This is part of what makes RSDS difficult to diagnose. Not all Doctors agree on a Fourth Stage but the evidence bears out its existence. Stage one is called the acute stage and can last from one to three months. 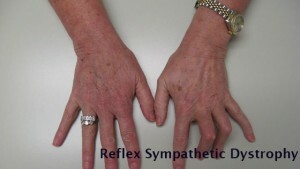 Some of the characteristics are warmth, coolness, burning pain, edema, increased sensitivity to touch, increased pain, accelerated hair/nail growth, tenderness or stiffness in the joint, spasms, limited mobility, some bony changes may be visible on X-Ray or abnormal amount of pain for the injury. In this stage there is decreased sympathetic activity. Stage two is called the Dystrophic Stage and can last three to six months. Pain is constant, as in stage one, and is throbbing, burning, aching, crushing in nature and is exacerbated by any stimuli. The affected limb may still be edematous, cool, cyanotic (discolored), or mottled (different shades). Nails are brittle and ridged. Pain and stiffness persists. Muscle wasting may begin. Patients usually start experiencing short-term memory problems, as well as increased pain from noises and/or vibrations. X-Rays may reveal signs of osteoporosis. Patients may start to repeat themselves. In this stage there is increased sympathetic activity. Some doctors will try and use tools such as x-rays, Bone Scans, thermograms, and others during Stage 2 and Stage 3 to confirm a diagnosis of RSDS. Understand that while these tests MAY show the presence of RSD, they are NOT conclusive. The only positive way of diagnosing RSD/CRPS is a physical exam by a doctor knowledgeable in RSDS. These other tests should only be used as one of many tools to aid in that diagnosis. They are also useful in tracking the progress of the disease. Stage three is called the atrophic stage and can last an unlimited amount of time. Pain can increase or decrease, depending on the person, and the RSDS may spread to other parts of the body. At this stage irreversible tissue damage may occur. Skin becomes cool, thin, and shiny. Contraction of the extremity may occur as well as atrophy of the limb (decreased joint movement). Skin atrophies (wasting away) and loss of movement or mobility may also occur. X-Rays may show marked demineralization and increased osteoporosis. At this stage many RSD patients are not likely to be effectively treated with blocks as the percentage of SIP (Sympahetically Independent Pain) is now much greater than the percentage of SMP (Sympathetically Mediated Pain), meaning the majority of the pain signals are now originating in the brain and not at the original RSD site where a local block would help. Pumps are usually discussed at this stage but there are other treatments available and more are coming all the time. Most patients will never advance to Stage 4. In this Fourth Stage, RSD is resistant to many forms of treatment and many Physicians would now recommend a Pump or a DCS/SCS. However, there are problems associated with the use of SCS units for RSD patients, even though they work well for other pain problems. Also in this stage there is an involvement of the inner organs. Always ask to speak to a Doctors other patients before undergoing any type of implant or surgical procedure. Educate yourself. If you believe that you may be suffering from RSD as the result of an injury, we urge you to call us at 1-800-718-4658 to discuss your legal rights or submit our Free RSD Case Evaluation.